I was disappointed that the weather didn’t cooperate with my photographic hopes for yesterday. Fog, wind and dripping drizzle kept the big camera under wraps, and I pulled the Canon out of my coat pocket just long enough to grab a few shots, but didn’t get many keepers. The light levels were so low, the autofocus generally didn’t. 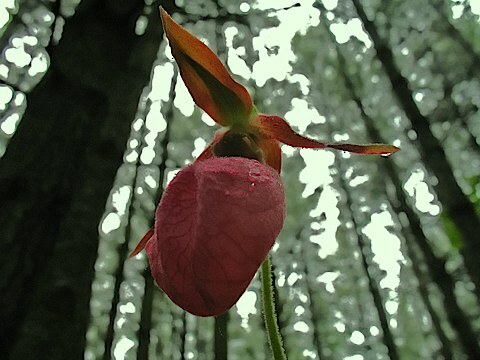 Here’s an unusual view of a pink lady’s slipper under a pine canopy, snapped while one of my hiking buddies held an umbrella over photographer and tiny camera, waiting for a lull in the winds. A cold front passed through while we walked a magnificent private preserve on the Blue Ridge Parkway; the temperature dropped almost ten degrees. I hadn’t dressed for upper-forties and the warmth of the car felt good on the return trip home. Yeah – it was cold yesterday AND this morning too. I know the light could have been better, but I really like the gray canopy behind the colorful lady’s slipper. Nice picture! I use to have a couple places on my property where lady slippers grew, but I haven’t seen one in years. I’m loving the cooler weather. This is probably the last breath of cool air we will have for months. It’s so nice today, sunny and 70 degrees. Perfect! I once tinctured some Lady Slipper after a friend disclosed a spot where they were growing. It’s a nervine/tranquilizer. I also tried to transplant one on my property. It came back the next year but not after that. Fred, is this wild orchid the one we call the “Moccasin Flower” up here? Your orchid seems to be all pink rather than pink and white like the Showy Orchis which will bloom here next month. I don’t know about the habitat your orchid perfers, but ours prefer the bottom of an old beaver pond, several feet down a steep and steamy incline and the bugs down there are abundant and voracious. We are having a bumper year for black flies and mosquitoes – the worst in a very long time.